Outside of the camera itself, the most important investment: camera bags. The right bag makes it easy to find all of your lens and accessories while keeping everything protected. It’ll also make carrying your heavy gear around as pleasant as possible. There are so many different bags out there to choose from, and they vary in price from around $15 all the way up to hundreds of dollars. How are you supposed to choose between so many models with such wide variances in price? We’re here to help! If you have a high-end camera, lots of lenses, and a wide range of accessories, you can’t get by with just any camera bag. You need tremendous protection, lots of pockets, and well-rounded features. That’s what you’ll find with the best professional-grade bags, but you’ll also find higher price tags that match the more robust feature sets. 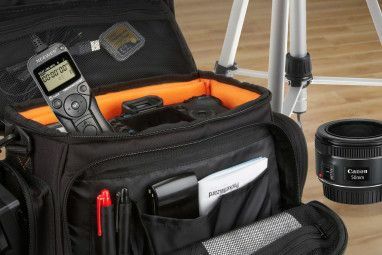 When it comes to quality camera bags, Lowepro is a name that comes up over and over again, and the 450AW is one of the company’s better options. It’ll fit two cameras, large 70-200mm lenses, lights, and even a 15-inch laptop. It has side straps for carrying a tripod, and it’s even large enough to carry around a DJI Mavic Pro drone This Is the Drone You're Looking For: DJI Mavic Pro Review This Is the Drone You're Looking For: DJI Mavic Pro Review Packed full of intelligent features like obstacle avoidance and subjet tracking, the Mavic Pro is an unbelievably tiny drone made by DJI. It costs $1000, and it's worth every penny. Read More . It comes with an all-weather cover, so you can walk around in the rain without worrying about your precious gear. This behemoth of a bag looks like it could survive an asteroid strike without even taking damage. (MakeUseOf does not endorse slamming asteroids into any camera bag.) Jokes aside, Pelican promises that this bag is dustproof, crushproof, water resistant, and air pressure resistant. For professional photographers who find themselves shooting in less-than-traditional situations, this bag is exactly what they need. It’s even on wheels, which makes rolling it around far more pleasant. This bag is designed for travelers. It’s large enough to fit two camera bodies, two to four lenses, a 15-inch laptop, and a tablet. And it’s just the right size for carrying on the plane. It’s on wheels, so you’ll be able to move it around an airport comfortably, even if it’s packed to the max with stuff. Like all good camera bags, it’s module, so you can adjust it to work with your particular kit. Peak Design is one of those Kickstarter darlings 3 Things to Consider Before Backing a Kickstarter Project 3 Things to Consider Before Backing a Kickstarter Project Before you back your first or next Kickstarter project, here are a few things to keep in mind if you don't want to get scammed or waste your money. Read More , and even though that crowdfunding campaign was quite a while ago, its bags are still regarded as some of the best out there. The messenger bag version will carry your camera, up to three lenses, and all your other photography goodies. What really makes it stand out is the look, though, as it offers a bit more style than many other camera bags out there. Peak Design makes its way onto the list twice, as we just couldn’t choose between the messenger bag and backpack variant. The capacity of the two bags is almost the same, but depending on your configuration, you might be able to fit an extra lens in the backpack version. Both will carry around a 15-inch laptop with your photography kit as well. 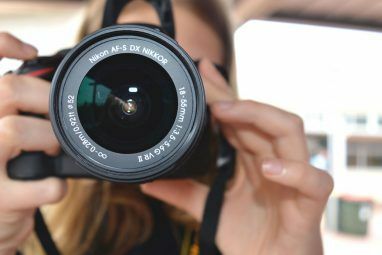 If you’re serious enough about photography These 9 Projects Will Make You Fall in Love With Photography These 9 Projects Will Make You Fall in Love With Photography If you're looking to get into photography -- or try something new -- these projects will help you out with inspiration, motivation, and ideas. 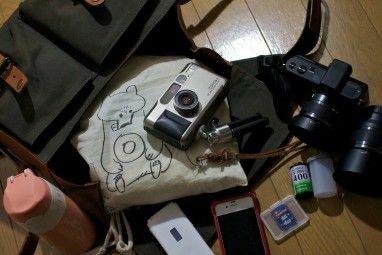 Read More to need a bag, but not so serious that you’re willing to spend hundreds of dollars, these budget-friendly camera bags should be more your speed. While they lack some of the premium features and protection of the more expensive bags, they make up for it with prices that’ll hit your wallet with far less force. If you want that Lowepro quality, but with a more budget-friendly price (and a smaller capacity to match), the Tahoe BP150 is for you. It’s a bit more expensive than some of the other budget models we’ll look at today, but it comes with features and durability that make it worthwhile. You’ll be able to fit a single camera body and three lenses in the bag. Adding in other accessories will decrease the number of lenses. As for laptops, you’ll be able to fit smaller 11-inch devices. This is a very well-reviewed backpack that comes with lots of space and features. It’ll fit two camera bodies and up to five lenses (the number of lenses will vary depending on the size). Aside from the space, another thing that makes this bag a worthwhile pickup is the included rain cover that’ll let you get out there and shoot even when the weather isn’t great. AmazonBasics makes good stuff at a reasonable price. It’s an extremely budget-friendly bag with decent capacity. You can squeeze in the camera, a couple of lenses, accessories, and a tablet. It doesn’t come with the messenger bag or backpack form factor, so this isn’t a daily-carry bag. But if you just want a dedicated camera bag that won’t set you back too much, this does the job. If you’re willing to spend a few dollars more, AmazonBasics offers a backpack that’s specifically designed to carry around a camera and laptop. It’s not the most stylish looking backpack out there, but it does promise to be quite functional. It can hold one or two camera bodies, three or four lenses, a few accessories, and a laptop up to 17-inches. You’ll have a hard time finding a more spacious camera backpack for the price. This is another solid budget bag that’ll fit most of your stuff comfortably. You can fit a single camera body and three to five lenses with a bunch of accessories. I actually own this bag myself, and it does the job quite well (I don’t do a ton of traveling, but I’ve taken it to a few conventions and it worked out just fine). While it’s made by Canon, and the description cites specific Canon models it will fit, the module pockets mean you can fit other camera brands without issue. You probably spent a substantial amount of money on your camera, lenses, and accessories so you don’t want to skimp on the bag that’ll protect it. 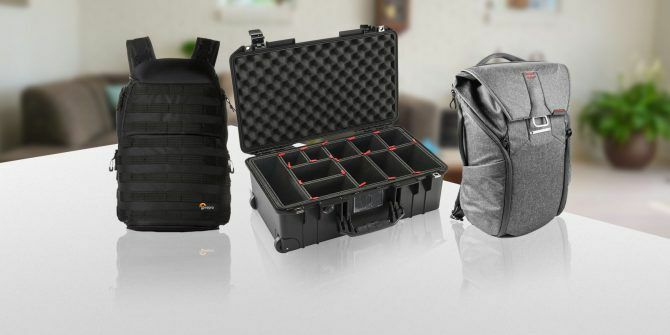 All of the bags above will keep your stuff safe while allowing you to carry around multiple lenses and accessories. Whether you’re looking to spend over $200 for a professional-quality bag, or you’re looking to save some money and spend less than $50, there’s a large bag that’ll work for you. What camera bag to you recommend for carrying around your bodies, lenses, and accessories? Share your choices in the comments!